Anybody with any interest in typography will know about Metafonts. In any case, Metafonts is a mathematical language for creating fonts developed by Donald Knuth. It is also the name of the interpreter that executes Metafont code, producing (rendering) fonts by generating bitmaps (images) that can be incorporated into websites and postscript systems. One of the characteristics of Metafont is that all the gliphs are defined by geometric equations. In order to use Metafonts as it is intended, however, a minimum of programming experience is required, or at least very useful. This, in itself, is a limitation for which Simon Egli, Marco Müller and Alexis Reigel tried to devise a solution, a solution that came to be known as Metaflop Modulator. 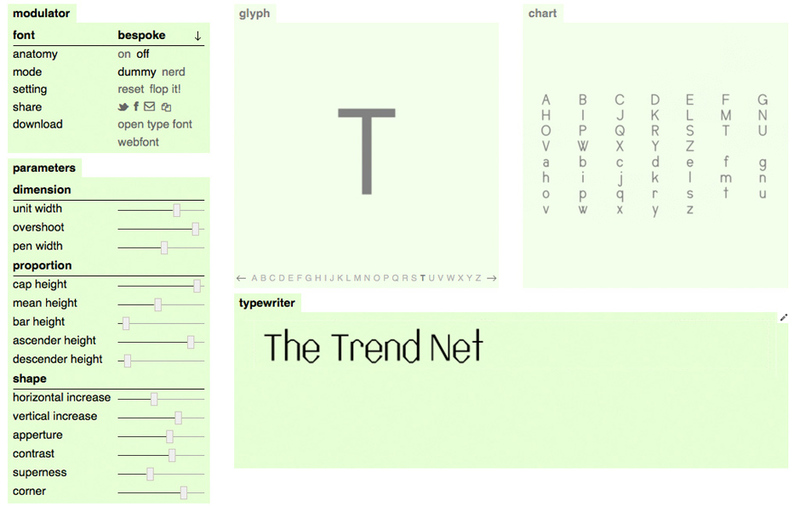 Metaflop is a web based platform for experimental fonts and type-related projects that uses, obviously, Metafont. The Modulator can be used to create customised, flexible Metafonts without having to deal directly with programming language, adjusting the typeface parameters (dimension, proportion and shape) according to your design project. In addition, the results can be downloaded as a webfont package and either embedded in your website or used as an OpenType PostScript font (.off) in any system or application that is compatible with the .otf format. Metaflop is, as one would expect, open source, and can be shared directly via social networks and email. In a nutshell, it’s all about experimenting with fonts and enjoying yourself. As they say in Metaflop “Font design is in fact lots of fun, especially when you make mistakes”.